I will offer price discounts on multiple item purchase. PM for more pictures. Leica M & 21mm purchased from Camtec in Montreal (Leica AD) and the 50mm from a large Canadian retailer. 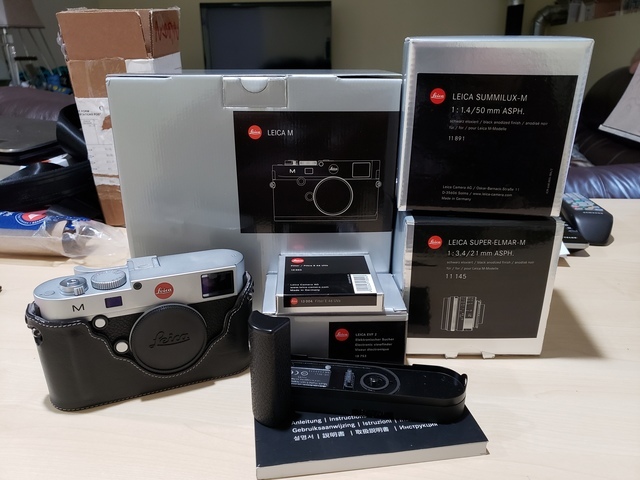 •	Leica EVF2 (18753) – Box and Paper, lightly used. •	Leica Multi-Function Grip HG-SCL1 (14495) – Manual, no box (sorry), like new condition. •	Thumbs-Up Hot Shoe thumb grip. Optically flawless. I don’t see any issues with the lens no separation, fungus, scratches on the elements, no oil on blades. Likely some micro internal dust, but nothing that should have any impact on image quality. Couple minor cosmetic marks on the exterior of lens hood, one minor scratch roughly 1 cm long and similar sized scuff on the other side. No impact on hood function or optical performance. Includes OEM box and papers, leather case and rear cap. I lost the front cap so I will include a Leica e46 UVa filter (13004) that I used instead of the lens cap. 21 ASPH Super-Elmar-M F3.4 (11145). Lens is prime condition, would dare to say to mint. Hardly ever used. Optically flawless. I don’t see any issues with the lens no separation, fungus, scratches on the elements, no oil on blades. Likely some micro internal dust, but nothing that should have any impact on image quality. No cosmetic marks that I can see. Includes OEM box and papers, leather case, rear cap and lens hood with cover.